I know you have most likely seen a stand mixer somewhere in one of the big restaurants or your friend’s big kitchen. While they are so popular, not many people will afford it let alone have the storage space for it. As such, people normally opt for mixing by hand but this also consumes a lot of time. When you have a hand mixer you will beat two birds with one stone. You don’t have to hassle for the space in your kitchen and the time you use to make your dough is lesser. I know cookies are pastries that are loved by both the young and old. Whether it’s because of its crunchiness or the flavors used to make the sweet pastries, I don’t know. But, the fact of the matter is, as long as you love cookies, you either have to buy them or make some at home. My kids and I enjoy eating cookies, so, recently I decided to start making them myself. You do know that making cookies involve making a dough. At first, I mixed by hand and trust me the work involved isn’t fun. So, recently I discovered that I could use a hand mixer and this became my ultimate saviour. Now, to all the bakers out there here is an article showing you the best hand mixer for your cookie dough. 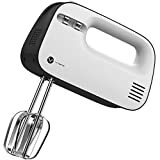 I can easily describe a hand mixer as an electric kitchen appliance that is supposed to be used to mix ingredients using two beaters that rotate at a high speed. The aim is to create an even mixture that can be baked to form the cookie or cakes. Note that the hand mixer is usually less powerful than a stand mixer. But it works fine since it has a powerful punch from the powerful motor of around 200-300 watts. It further has a 3-9 speed setting to help you mix light or heavy dough at whichever speed. 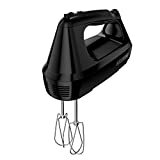 If you love baking like I do then the hand mixer will handle most of your mixing needs. From a simple cake dough to a cookie dough your work will be easier with a hand mixer. They are generally cheaper than the stand mixers. They don’t use up storage space because they are small appliances. They can be stored in the cabinets, drawers among other places. You see, if you were to buy a stand mixer you would have had no choice but to have the placement and storage space. They are easy to clean and therefore hygienic. You don’t have to worry about the possibility of bacterial growth. You can easily detach the beaters and clean it in a dishwasher or sink. They are easy to use because most of them come with a single touch speed function. They are light in weight for easy carriage as you mix the ingredients. When it comes to tasks like whipping cream, creaming butter and sugar or preparing frosting, the hand mixer is the only tool that will serve you best. The work of a hand mixer is limited to lighter doughs. You can’t use it to make pizza or bread dough. 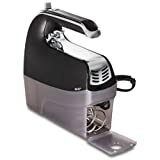 The hand mixer may make your kitchen messy especially when you are unable to control the splattering. You have to operate the mixer manually for effectivity. Remember they have lesser power than the stand mixer which limits their mixing capabilities. The beaters should be made of wire without the thick centre part that is found in the traditional beaters. The wire beaters are easy to clean. Some hand mixers have about 9-speed settings. However, if your mixer has 3 distinctive speed settings, it will serve you just fine. I prefer the ones that have a slower starting speed because they avoid splattering. In fact, the slower speed is better. Your hand mixer shouldn’t compromise on the stability. If it has an indention on the underside of the motor housing the better because it will be able to perch on the edge of the bowl. A good hand mixer will have versatile features that fulfil tasks that are done by a stand mixer. Ensure that it has locking power heads: while most hand mixers will have it, you need to confirm that It’s present. You don’t want your beaters to pop out when you are mixing. Choose the ones made using stainless steel attachments: you see, this is the best material for your whiskers, beaters or hooks. The material is strong, durable and dishwasher safe. The beaters shouldn‘t have the traditional centre post: this is because without the centre part, cleaning it is easy and you are sure to leave the mixture in the bowl as opposed to sticking in the mixer. 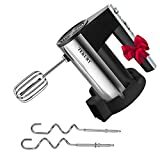 If it has a separate whisk attachment the better: you know these are perfect when you need to whip your cream and aeration of your ingredients. Dough hook: it’s almost obvious that finding a hand mixer with the capability of mixing a bread dough is next to impossible. When you have this hook, you will mix your bread or heavy cookie dough. You may have a hand mixer for anything between $20 and $100. But remember the prices don’t matter as much as other features do. Since this is a small kitchen appliance, its price is never outrightly high. Note that, the more stuff you have to mix the longer the time you will be holding the mixer. So, stick to something light and easy to hold. This is important since you will be working on your dough manually so you need a firm grip. Check to see if you are comfortable holding the hand mixer. Depending on your preference, the hand mixer will have anything between 3 and 9 settings. However, it’s important that the mixer shows that it has a slow starting speed. If your mixer has other attachments like the dough hook, wire whip and flat beater the better. Is it the kind that you will easily clean using a dishwasher or warm water and soap? Go for it. You don’t want an item that will harbour dirt and thereby become a health hazard to you. For some people, the appliance needs to blend in with their colour scheme. If that is you then go for the select colours you desire. This is a one-touch button hand mixer. It’s our best choice in the hand mix category. It has a 9-speed setting option and It’s BPA free. The premium tool is as easy to store as it is to use. It guarantees you a smooth start to avoid splatter. It has extra attachments which include the long beaters, chef’s whisk and dough hooks. I like the fact that it has a sturdy Snap-on case to store the mixer and all other attachments. This makes it look professionally nice. This tool is ideal for powering through heavy ingredients. I love the extra whisk that is ideal for whipping your cream or your egg whites. It has a stainless-steel turbo beater which is your ideal partner when you need to mix heavy dough. It further has a soft start feature that will help reduce the splattering. Furthermore, it has a lockable swivel cord with a beater ejector button. It features a 7-speed tool with a comfortable hand grip. 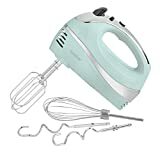 This hand mixer comes with other 5 attachments which include two professional style wire beaters, one whisk, two dough hooks all of which are dishwasher safe. Its storage is a non-issue because it has a storage case that keeps the mixer and the attachments in one spot. It has a 6-speed setting that allows you to start slow and finish fast if you wish to. It further has a turbo button to help boost the power and consequently work on the tough mixtures. The hand mixer has a 5-speed adjustment setting and a turbo function key to eject or speed up your speed function. It is easy to clean and store. When it comes to the kind of beaters you want to use, you are spoilt for choice as you could choose to use the dough hooks in order to produce the velvety, delicious and soft mixes. It has an omnidirectional heat design dissipation method. This helps the mixer to release the excess heat in case it’s heated up. Besides, it has a sturdy construction with an easy to hold handle. It’s made using the durable stainless steel and you get 2 stainless steel beaters, 2 stainless steel hooks and a plastic stand. The hand mixer offers exceptional performance with its 6-speed settings. It further has a slow first start speed to avoid splattering. 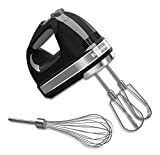 The hand mixer comes with durable chrome beaters and the balloon whisk. The beaters are strong enough to offer you quick and thorough results. It has a retractable cord that you push the button to rewind the cord once you are through and pull it out when you need to use. This safety measure is especially important for those with curious kids. Furthermore, it has a power burst feature that gives you the extra power when you need to work on a thick dough. Use this to mix anything from cookie dough to milkshake. You may further make use of the innovative slow speed pulse function to prevent splattering. Also, use its bowl rest when you are adding ingredients to your mixture thereby avoiding the dripping of the mixture on the kitchen counter. It has 6 different speed settings to change to the desired recipe when a need arises. It is easy to clean and store. Where all the attachments are dishwasher safe. All the 6 attachments fit in the storage snap-on case of the mixer. This sleek and stylish design hand mixer is your effective appliance if you need a perfect dough. It’s a compact and lightweight design allows you to transport it to wherever you need to. It has a 5-speed turbo design setting that helps it mix your lightest souffles to the toughest dough mixture. The device is easy to use with the thumb operated speed settings and easy handling of the tool. You can use it for whipping your eggs, stirring your gravies and making doughs. It has 2 beaters, I balloon whisk and 2 dough hooks. The hand mixer is further light and has a perfect handle. This lightweight electric hand mixer is designed with the modern stainless-steel style. It has a 6-speed setting with the ability to start at a low speed. It comes with 2 beaters and 2 dough hooks. The item is easy and comfortable to use even for beginners. It’s compact made and easy to use with a turbo to influence the powering of the mixer. Here is your mixer appliance for each of your mixing needs. It comes with 5 dishwasher-safe attachments and a full-size storage case. It has a power boost function to get through the tough mixing doughs. The sturdy construction makes it easy to use by all and sundry. The item is further made to last and fit into any kitchen design. This powerful hand mixer is highly powered with its 3-level speed. It comes with 2 extra dishwasher safe attachments and a sturdy clip-on storage case. The appliance will compliment your kitchen with a modern retro style pop. Its eye appealing and easy to work with. However, you should never use the mixer on a heavy dough and don’t power it for more than a minute continuously. 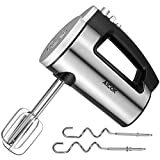 With that said, you can go and find your best hand mixer on Amazon but remember, the brand of the mixer is not as essential as the features it has.